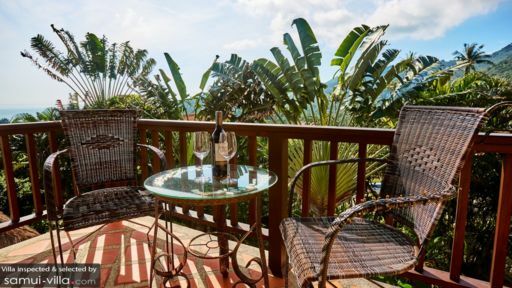 The beautifully appointed Villa Lilawadee is a tropical vacation dream come true. Located 500 metres away from the main road, the villa is nestled within a complex of private villas. Enjoy the serenity and ultimate privacy that the home offers, and while your days away in a leisurely manner within. A variety of local amenities and attractions are dotted around the vicinity, so it’s convenient to get out and about. As with all luxury properties, Villa Lilawadee offers a full range of modern amenities and impeccable service. Eight guests are comfortably accommodated in four bedrooms. Just like the common areas, each of the bedrooms are decorated with care to facilitate rest and relaxation. Design elements common across all rooms include wood panel flooring, cream walls, decorative bed linen and vaulted ceilings. All rooms feature an en suite complete with vanity, toilet and shower recess. A balcony with views out to the sea extends out of the upper floor bedrooms. 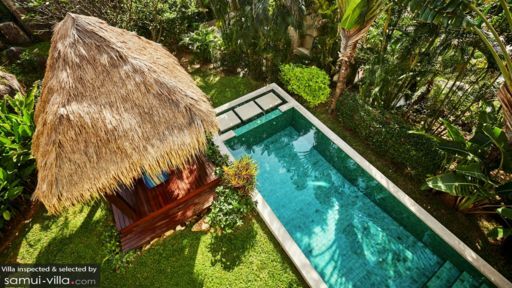 A well-manicured garden, complete with lush foliage, private pool and bale is all yours at Villa Lilawadee. Soak up the tropical vibes as you enjoy dips in the turquoise pool or sip cocktails by the poolside. The charming thatched roof bale, outfitted with cushioned recliners and a coffee table is a favourite outdoor hangout for guests. Much attention is paid to aesthetics and comfort at Villa Lilawadee. The common areas, featured in an open layout come complete with contemporary furnishings, soothing cream colours and modern amenities. A fine selection of ornaments - from paintings to Buddha statues - add an Asian accent within. The living area, with its wraparound couch, flat screen TV and media equipment is ideal for entertainment and relaxation. It extends out to include a dining area, which comes furnished with an eight seater dining set and an open kitchen outfitted with wooden cabinets, a carpet, marble countertops and a full range of cooking equipment. Twice weekly housekeeping services are included with your rental, and a security guard at the gate keeps the property secure. Your villa manager will readily assist with taxi service, as well as bike and car rentals. For a day out at the beach, hop into a car for a five-minute ride to Chaweng Noi Beach, or a 14-minute drive to Chaweng Beach. The former is clean and quiet, with shallow waters and eateries dotted along the white sand coast. Further up north at Chaweng Beach is where the action happens. The area is bustling and vibrant with restaurants, bars and nightlife venues. While you’re in the vicinity, take a stroll out to Chaweng walking street, located a skip away from the beach. With a labyrinth of stalls selling souvenirs, knick knacks and street food, the walking street offers a great way to discover the local shopping scene. 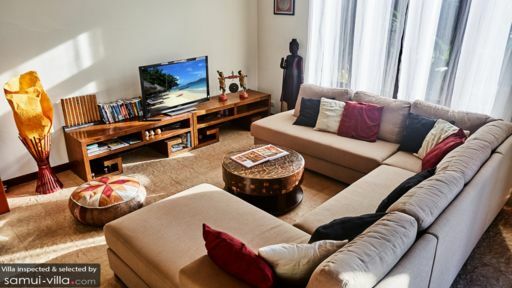 On days where you feel like lounging lazily indoors, you’ll be glad to know that a variety of local amenities and attractions are easily within reach. Enjoy a meal of tasty Thai fare at Phensiri Thai Bistro or feast on wholesome vegetarian fare at Veggie Bean. Learn how to whip up Thai dishes at Pai Cookery Class, or work up a sweat in a CrossFit workout at Superpro Samui. All amenities and restaurants are located a four-minute drive from your villa. Planning for day trips is a breeze - you won’t have to travel too far out to visit some of the best attractions on the island, and your villa manager will readily assist with transportation arrangements. Family-friendly attractions within the vicinity include: Big Buddha (a 24-minute drive), Lad Koh Viewpoint (a six-minute drive), Hin Ta and Hin Ya Rocks (a 22-minute drive) and Fisherman’s Village (a 15-minute drive).